At this time of year, we are all swamped with letters, phone calls and emails from charities. It's natural. After all, people are likely to be at their most generous at the holidays. Not to mention that philanthropic gifts need to be clocked in by December 31st to receive a tax deduction. It's no wonder that, traditionally, charities have received the bulk of their yearly donations during the last couple months of the year. It's a great time to give. But it's also important to make sure that you donate your hard-earned dollars well. That takes more than a generous heart. It also takes the rational thought of a hard-nosed consumer who can pick the best choices from a myriad of opportunities. Unfortunately, many donors don't put that much thought into where their donations go. 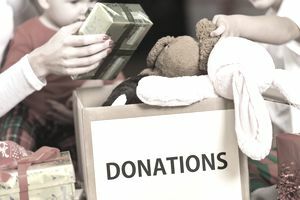 Research into charitable giving suggests that maybe a third of people who donate spend any time at all on researching the groups they give to. We are all more likely to think harder about the refrigerator or car we buy than we do about where we send our donations. Don't let that tendency affect you. Take some time to think about your charitable goals, the areas where you want to help, and then seek out those charities with the best track records. Doing so will make you feel even better about your charitable giving. Check any charity against the "Consumer Reports" of the philanthropic world. GuideStar lists more than a million nonprofits in its database, all of which have met IRS criteria for exempt organizations. You can check here to make sure your charity is a 501(c)(3), and examine its latest tax form, called a 990. The Better Business Bureau's Start With Trust website keeps track of complaints against nonprofits, just as it does for businesses. A nonprofit that displays the BBB logo on its site has passed a rigorous screening process from the BBB. However, not all nonprofits are listed here, but many large, national ones are. Charity Navigator ranks charities based on their efficiency, transparency, and accountability. The rating agency gives charities up to four stars, providing an easy way to find the organizations where your contributions will be safe and effective. You probably will not see your local or most smaller nonprofits at this site. CharityNavigator doesn't rate all charities. Great Nonprofits provides user reviews of nonprofits, which can give you a more personal view of what real people, who either donate or receive services, think about a particular nonprofit. These reviews are based on people's perceptions, not on hard data about effectiveness. So use them to assist your charitable choices, but not determine them. GiveWell has the scoop on charities that do the best work on issues such as health and poverty on a global scale. This organization studies charities in this sector for the most effective ones. In other words, if you want to make sure your money is doing the most good, check out GiveWell's recommendations. There are only a few recommended charities on GiveWell's list but in the murky world of global philanthropy, picking one of these trusted groups could be one of your best choices. The Life You Can Save was founded by Peter Singer, a sometimes controversial figure in the philosophy of philanthropy. The Life You Can Save website encourages people to give to organizations fighting extreme poverty around the world. Singer believes that every dollar should count and recommends only those charities that do the most good for every dollar spent. Go local and don't micromanage. A good rule of thumb is to start locally for your charitable giving. You will help your community, and you can know those organizations in a way you can't with national and international ones. Local nonprofits also help employ your neighbors and friends. After you pick a couple of local nonprofits, then think about going further afield. Don't put strings on your gifts. Once you decide on a nonprofit that you like and trust, be generous enough to give an unrestricted donation. Unrestricted means that the nonprofit can use the money where needed. Such contributions provide organizations the flexibility to meet any of their needs. Add to your emergency giving. If you gave earlier in the year to an organization helping in a disaster (think of the Ebola crisis, the Nepal earthquake, or Hurricanes Harvey, Irma and Maria), go back to that organization and give more. Much of the need from any disaster comes later, during the recovery period. Your continued support will mean so much to that nonprofit and the people it helps. Also, give money instead of goods. Things like clothing or household supplies all have to be sorted and shipped, entailing many hours of times that could be spent in better ways. And with money, an organization can buy what they need in the form of supplies closer to the emergency site. Don't be a social dummy. In a world of Facebook, Twitter, Instagram, and YouTube, it is easy to get carried away with the fundraising appeals coming your way. But stop and do your due diligence before giving. Check out each charity using one of the services listed above and make sure you know who is behind the appeal. If in doubt, say no. It's also much better to give more to a few worthwhile charities than small amounts to many. Make your donation count by bulking it up. There is no doubt that giving makes us feel good. So go ahead, be generous this holiday season. If you do so with both your head and your heart, your giving will warm you and others for a long time to come. How Does AmazonSmile Work (and Should You Use It)?